Tony Freudmann is the Director of River Oak Strategic Partners Limited, in London. This group grew out of a US company, River Oak Investment Corp. In 2014, he was asked to head up the project of re-opening Manston Airport in England. Manston history dates back to WWII when it was a military base. It became civilian in 2000. Tony, along with 20 consultants are leading the process for a consent order for an infrastructure project of national significance, applying for ownership of the site directly to the government. The idea is to turn this into a major cargo hub, which would attract major operators, airlines, and others. It’s a complex project involving finance and public policy, dealing with government departments, as well as local departments at both county and city level. 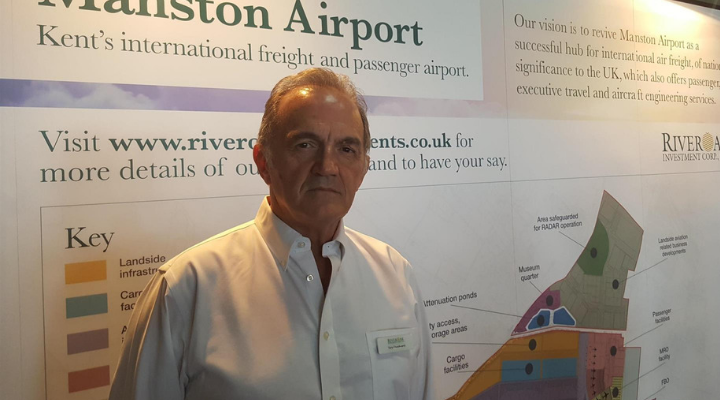 Tony believes that if the airport were reopened, it would regenerate the area by bringing in jobs and boosting the local economy. They are now in the final examination of a few particular things, with about a year to go. Once they get the final development consent order, they expect to start investing heavily into the airport and its revitalization. Tony enjoys spending time with his children and grandchildren. He also enjoys anything about culture, theater, movies, opera, art galleries, and the like. What inspired you to get involved in this aviation business? My family had been involved with travel agencies since the 1960s, so it’s just in my blood. My late father was one of the pioneers of travel in Europe, after WWII. So I’ve always had an interest in travel, aviation, and tourism. This particular interest goes back 20 years when I was hired by a company that wanted to convert this airport from military to civilian. I was drawn to it because I saw an opportunity for the area. I enjoyed the work, my knowledge and experience contributed to a good understanding of what it was about. You work on a lengthy project because you are committed to it and you enjoy it. What made you select to reopen this specific location? Was there something about it? Yes, there’s something unique about it. The UK has limited land available for development. In the southeast of London, there is a shortage of runways, we have chronic congestion, and building new runways is controversial. People object because of the noise and inconvenience. This airport has a very long runway and sits there as something that has huge potential and is being closed. The other advantage is that’s it’s close to London, which brings in business whether it’s airfreight or tourism. This airport can provide additional capacity to satisfy London’s needs. What do you think it is that makes you successful at the ventures you’ve been involved in? I’ve had ventures that have not worked, we all have. With this one, it’s a combination of my knowledge and experience in the field of aviation, travel, and tourism over the years. My legal training helps me when dealing with regulations and planning laws and those kinds of things. I was a county leader, your terms a county executive, for several years. That gave me an understanding of how the public sector works. I feel like I’ve got the complete set of skills to deal with the development of a major international airport. What has been your most satisfying moment in business thus far? My most satisfying moment was in 2000 when we bought this airport to us and converted it. That was a big success that I was very proud of and still am to this day. What does the future hold for you and your business, and what are you most excited about? I’m excited about seeing this coming to pass, after all these years. To create a successful business that makes a real difference for the people who live there. To be able to employ them, create a trade for the economy, and to attract tourism. Just to see this project actually come to fruition. Going on from here, to be able to do the same thing at other underused airports in other parts of Europe and the US. I wouldn’t say there’s any one book that impresses me most. There’s an Italian book called The Leopard by Giuseppe Tomasi di Lampedusa, which is about change and managing and adapting to change. I’ve read and re-read several times. A number of Dickens novels, which I find to be reminders of the way unregulated businesses can treat the poor. The need to remember at all times to behave in a civilized and proper way. The Dickens insight into the greed of some people is a lesson for all. I also enjoy the books written by a well-known British historian, Antony Beevor. He’s written a series of books about military campaigns. What I find fascinating about them is the man management. The decisions people make, how they make them in the context of war, the responsibility, and pressure on senior officers, making important strategic decisions and plan things. I think it’s helped me in the way that I approach my work which involves everything from huge strategic decisions to small micro decisions. What is a recent purchase that you’ve made to help with this new venture? There’s not really been anything like that. I use a mix of technologies when running a project. We all work with project related software that covers everything from conference calls to meetings, to analyzing reports. I like to balance that with regular person-to-person conversation, either in-person or on the telephone with key members of the team. I find, despite all the available technology, hearing a human voice allows me to judge whether that person is stressed, busy, telling the truth, whatever it might be. I return calls, emails, texts or whatever it might be, which shows that I’m ultra reliable and dependable. That builds relationships with team members and potential investors and customers in a way that matters. It’s a combination of using both modern technology and old-fashioned techniques.